Home | Practice Areas | Auto Accidents | What Should I Do If I’m Involved in a Car Accident? Going through a car wreck can obviously be a traumatic experience even if no one is hurt. It can be difficult to think clearly and easy to make mistakes that can seriously damage your chances of obtaining compensation for property damage. Taking the right steps after a car accident can go a long way toward ensuring your rights will be protected. Is There Anything I Should Do When I Get Home After an Accident? Can You File a Police Report the Day After an Accident? Should I Bring a Claim for My Injuries? If you are involved in a car accident in Pennsylvania, the most important thing to remember is that you must not leave the scene of the accident. It is important that you assist anyone involved in the accident, either in your car or the other car, who may be injured. If you leave the scene of an accident, you may have your license revoked or suspended, and you may face even worse charges if someone is injured and you do nothing to help them. Remember to remain calm. If your vehicle can still be moved, keep it close to the accident but move it to the side of the road to not obstruct traffic. This is particularly true if you have only been involved in a minor “fender bender.” You can actually be fined under Pennsylvania law if you refuse to move your car. Pay attention to the traffic situation around you and any other potential dangers, such as a car fire. Exchange Information: This includes your name, where you live, how you can be contacted, your driver’s license information, your license plate number, the make, model and color of your car and your insurance information. The other drivers involved in the crash should also provide this information to you. Take Pictures: Smartphones are ubiquitous these days, and if you have one, make sure you take pictures of any damage to your car, any damage to the other car, any injuries suffered by passengers in your car as well as pictures of road conditions, weather conditions and perhaps recognizable landmarks. Gather this information as soon as possible. Call the Police: In Pennsylvania, police do not have to cover a minor fender bender. We cover how to file an accident report in this case below. You should call the police if someone has been seriously injured or killed or if your car or the other driver’s car has suffered significant damage. Call Your Insurance Company: Do not embellish the facts or exaggerate the situation. Just tell them as calmly and clearly as possible what happened. Stick to the facts. Seek Medical Attention: Even if you think you have not suffered any serious injury, make an appointment to see your family physician as soon as you can after the accident or visit an emergency room of a local hospital. Make sure you tell them that you have been in a car accident. Have a Trusted Mechanic Inspect Your Vehicle: Sometimes there are damages to your vehicle that are not visible to the naked eye or readily apparent to someone who is not a professional. Never Make a Recorded Statement: You do not have to provide any recorded statements to file an accident report. Making a recorded statement means it can be used against you later if you file a claim. Never Answer Questions You Are Not Asked: It is the human tendency to expand and tell stories. Do not assume that just because you get into what seems like a friendly chat with the other driver that they would never use any information you provide to them in a claim against you. The same goes for any conversation with the police officer. Only answer the questions that you are asked directly. One of the most important steps after a car accident will be to jot down everything you possibly can after the wreck takes place. This includes any property damage that may have occurred as well as the details of any injuries you might have suffered and how they affect your daily life. If you are involved in any sort of insurance dispute, these details can help you many months afterward, when your memories of the event could become fuzzy. The Accident Itself: Record every detail you can remember regarding the accident, such as where you were going, who you were with, weather conditions, everything. Write down all of the things you felt or saw — every shock to your body, every twisting motion and every blow you might have taken. Also make a record of everything you remember people saying, whether they were involved in the accident or were a witness. Your Injuries: If you were hurt, make a note of all the discomfort you experience. This not only means physical pain, but also any lack of sleep or anxiety you might be going through. Your Losses: You may have to deal with medical bills, lost wages and other losses. Remember, as we mentioned above, police in Pennsylvania do not have to go to the location of, investigate or report any minor car accident or “fender bender.” You may not want to report a minor accident for fear that it will increase the cost of your insurance. Not reporting it, however, is against your best interests even if the accident was the result of your negligence. It is difficult to determine exactly how “minor” an accident is because in most cases someone involved in an accident is in a bit of shock or confusion. Not all damages to a car are visible nor is every injury observable. It also makes sense to file a report because it will protect you if anyone else involved in the crash files a claim or exaggerates what happened. Filing a report also makes sense for insurance coverage. If you do not file a report, and then discover at some later date that the accident has damaged your car or caused injuries, not reporting the incident after it happened may void your coverage. When you file a report about an accident not investigated by the police, you are not necessarily filing a “police report.” But you are reporting on the accident. This is why it makes sense to gather as much information as possible at the scene of the accident because then filling out the required form will be that much easier. You have up to five days to report the accident after a minor car accident. You should use form AA – 600. On the form, state the accident’s location. This includes city or town, number of the highway or the street name. List everyone involved in the accident. You need the names and addresses of everyone involved, including passengers even if they were not hurt. On the form, list the vehicles involved in the accident. You need the licenses and the insurance information of every car involved. Draw an accident diagram. The form has a space for you to draw your version of the movement of the cars just before the accident happened as well as when it happened. Fill in the narrative. The form also allows you to tell what happened in your own words. Describe everything that was taking place just before the accident and remember to include the weather or road conditions. In many cases, injuries you suffer in a car accident do not show up until days or weeks after an accident. Even a crash at relatively low speeds can generate enough force to injure you. Here are some of the most common injuries that do not appear until days or weeks after a car accident. Whiplash is what is known as a soft tissue injury. Sometimes hours or days after an injury you will feel pain in your neck or your back, there may be swelling, and your mobility could be reduced. Soft tissue industries do not show up on x-rays, so it is important that you see a medical doctor as soon as possible after your accident, even if you feel fine at that moment. Symptoms of a concussion often show up after a car accident. A concussion is an injury to your brain and can be serious. Some signs of a possible concussion include trouble thinking, trouble remembering, headaches, nausea, unusual sleep patterns, dizziness and lapses in concentration. If you experience any of these syndromes, see a doctor immediately if you have not already done so. Other symptoms you need to look out for in the days following a car accident include tingling or numbness which may indicate a pinched nerve or herniated disc, any abdominal pain which may be an indication of internal bleeding, or even emotional pain including depression or anxiety which are related the circumstances of the accident. 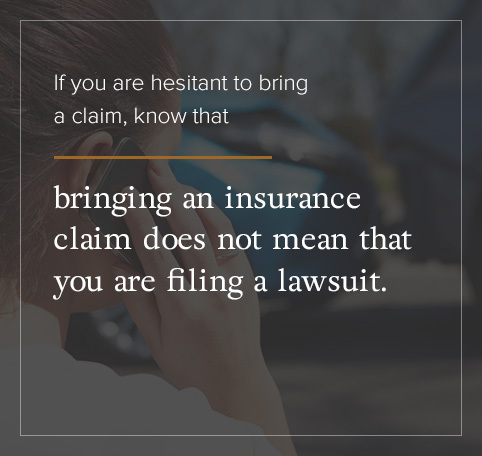 If you are hesitant to bring a claim, know that bringing an insurance claim does not mean that you are filing a lawsuit. The vast majority of our cases settle favorably without filing a lawsuit. Nonetheless, you may hesitate to bring an insurance claim for fear of being seen as being “the suing type.” Rest assured, the people we represent are just like you — honest, good citizens, who wish that the accident had never happened, and just want to be treated fairly by the adverse insurance company. If you would like more information on the proper steps after a car accident or if you are having problems with your insurance company after a wreck, KBG Injury Law may be able to help. Visit our contact us page or call 1-800-509-1001 to learn how we can help you.